When it comes to the concepts of connected homes or smart, activity-based accessories, we rarely think of bicycles. Outside of an app, a wearable, or a combination of the two, there’s very little to smarten up bike rides. That’s where something like the SmartHalo comes in. 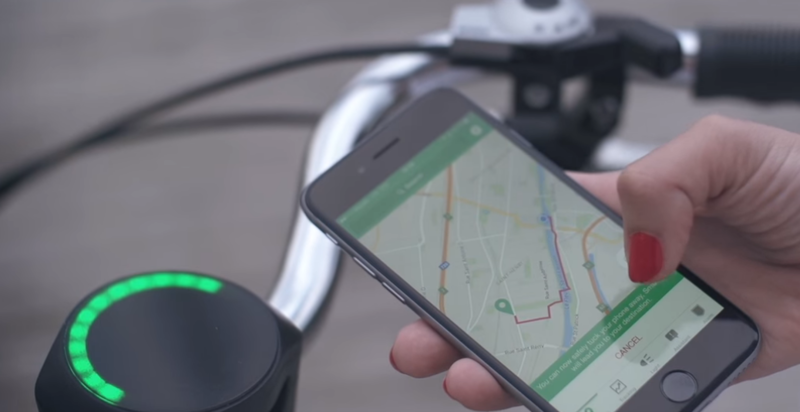 Backed by a highly successful Kickstarter campaign, it’s all about smartening up bicycles. Priced about $150, it’s an electronic accessory that adds a whole wealth of features to your two-wheeled companion. As to what it does, it’s probably easier to list out what it doesn’t do. In all seriousness, though, the SmartHalo does quite a bit. Among the details are a visual speedometer, fitness tracking, compass, light, and notification system. There’s no display to be found, but that doesn’t hinder its capabilities. In fact, once paired to your phone, you can put the handset away, relying on the innovative LED light system. Both Android and iPhone devices can connect via Bluetooth Smart and ANT+. Installation is rather simple and uses a clamp system that works on pretty much all bicycles. You’ll need to use the bracket, and, in some cases the risers and rubber spacers to secure itself. In some cases it takes all of 5-10 minutes to put together and it utilizes a special (HaloKey) magnetic key. Because of the key, the SmartHalo stays put and is not susceptible to theft. Well, that, and the internal alarm system keep it in place. For those who need to use some of the rubber spacing or longer screws, it can be somewhat tricky assembling if only because of the number of pieces. The included hex screw is thin and it can be awkward to hold things together. The great thing is that once in place, you’re good for the long term. Although the unit is essentially meant to stay put in a permanent manner, it does need to be recharged. You’ll get about three weeks of 1-hour rides out of the internal battery before you plug it via USB. Once physically in place, you’ll turn to the mobile app to handle the controls and settings. We found the Android app to be intuitive and helpful, especially as first-time users. There’s plenty here to spell out the features and options; you’ll be riding in no time. The SmartHalo is just that: a halo of light. With 25 LED lights that circle the device, it’s quite interesting how effective things can be, even without an actual display. It takes very little time to understand how the lights work across its various functions. Using turn-by-turn navigation, for instance, the SmartHalo indicates which way you need to turn and with the right amount of notice. It’s worth pointing out here that it’s not Google Maps that powers the navigation but Open Street Maps. This isn’t necessarily an in issue, though, because we find benefits in using both systems on our phone. Let’s say you don’t care so much about getting from Point A to Point B but would prefer to just find your own way to a destination. Maybe you want to mark where your car is parked and then always know which way to go to get back. Use the compass and watch how the light seems to float around, always giving you an indicator of the marker. Similarly, the app is helpful for times when you need to find your bike. Pull up your phone and it will give you a pinpoint of where its last known location. Very cool stuff which comes in handy when you’ve gotten off the bike to explore new terrain on foot. The SmartHalo automatically recognizes when its time to turn on the light. Indeed, it not only has the LED lights on top of the plate, but it also has a few to lead the way, too. 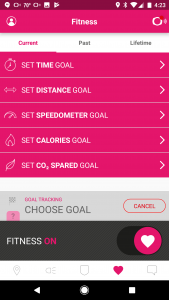 In terms of fitness tracking, we really like what the SmartHalo delivers. Too often we find that apps can’t effectively calculate biking details. But, since this one is literally connected to your bicycle, it can help track speed, elevation, distances, calories burned, time, and more. Moreover, the app also archives things for you so you can look back on individual rides or cumulative totals. 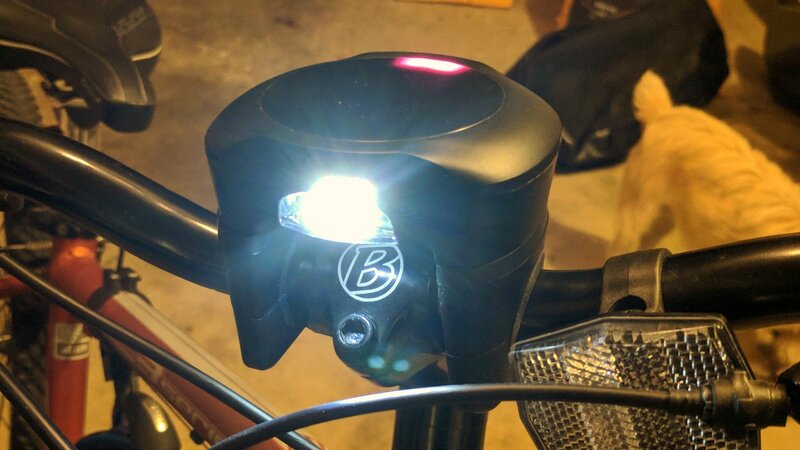 As it pertains to an alarm system, you’ll sleep easier knowing that your bike will sound off when someone messes with it. The internal sensors can detect when a would-be thief starts rocking it back and forth. The alarm can be manually controlled with a custom code that you tap on the SmartHalo. The better, automatic side of things kick in when you approach with your phone. Once they detect each other, they alarm is deactivated. Do note there is no GPS unit inside of the SmartHalo. It’s not going to show you its current location on a map. Additionally, it relies on your phone for the navigation. So, keep those in mind when setting out on a ride somewhere, especially if in a sketchy area. The notification system is a nice feature to have when you are expecting calls or messages. Heck, it’s even better when you aren’t expecting them and have your phone tucked away in a backpack or bag. A quick blink lets you know that someone’s trying to reach you. There is an audible notification for turns and other functions, but you likely won’t hear it if riding with headphones or earphones. You can adjust the volume level; play with what feels right for how much you want to be notified. Sometimes we just really want to unplug from the world. One of the biggest pain points we have when trying to unplug for a bit is the fear of missing that all-important phone call. What’s more, we hate having to hold onto a phone will navigating our way across busy or rough terrain. Both of those problems are alleviated here. 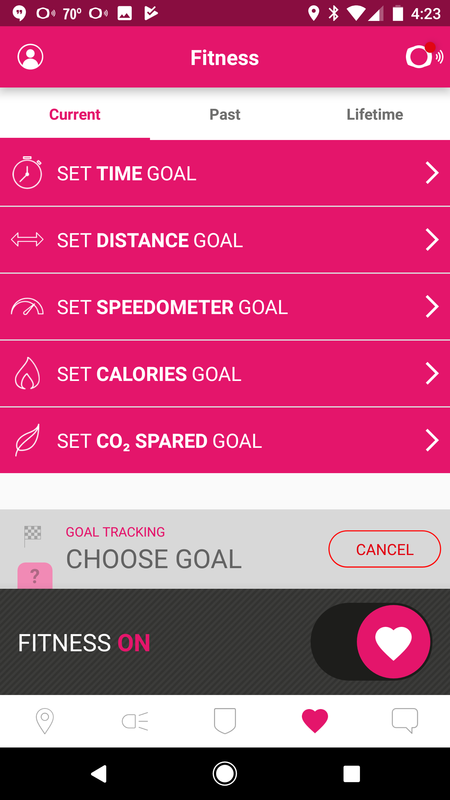 We loved the fitness tracking in the app and appreciate that it keeps a log of things for us. This is important and helpful for those training for a special event; it’s also great just to help motivate someone looking to loose weight. The LED lights are a fun and intuitive and took very little time to understand. You may want to dial off notifications in the early rides and slowly introduce things. Otherwise, you could find yourself overwhelmed a bit in the first few days. 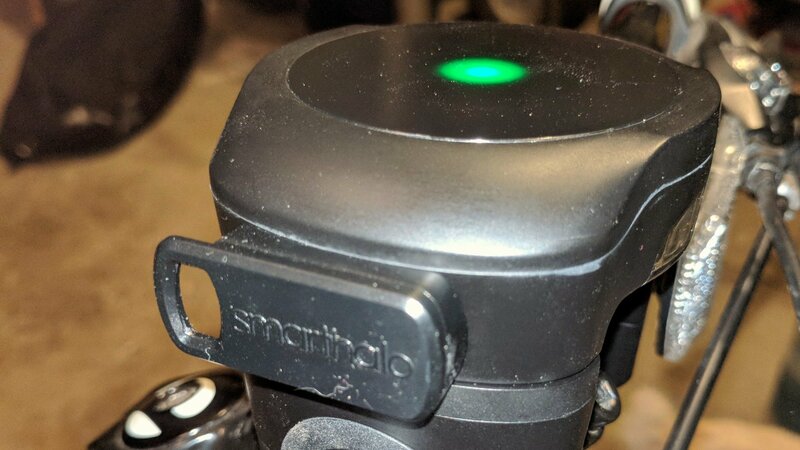 The SmartHalo is just about the coolest thing you can add to a bike — and pretty much the most feature-rich, too. You could probably cut the number of details in half here and we’d still be game to purchase one of these. 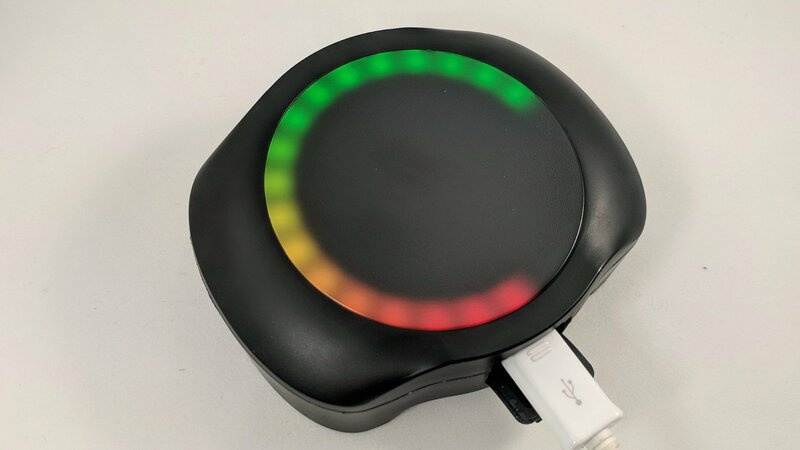 Purchase a SmartHalo from its website today for $150. Designed to work with any bicycle, the SmartHalo adds a whole range of smarts to your two-wheeled companion. It can withstand any weather condition you can, automatically tracks your activities, and even protects against would-be thieves.